Ruth Saunders was in an unfortunate accident when she was three years old. Her parents died, her car seat broke free, and she went flying face-first through the glass. Her maternal grandmother, Rachel, immediately rearranged her life and took the responsibility of raising Ruth. After several surgeries and side-eyes from strangers because of her scar and disfigured cheek, Ruth had been through enough. She needed a change. A chance. New surroundings. A fair life in which looks don't matter. Ruth made a bold move at the age of twenty-three. She left Massachusetts, packed up her belongings and 70-year-old grandmother, and moved to Hollywood. She even quit her job in order to work full-time on a script loosely based on her own life. Six years later, she finally found her break. The sitcom she wrote, The Next Best Thing, has gotten the green light! The Next Best Thing is a different spin on Hollywood. Through books and television shows, we usually see actors struggling to make it big. 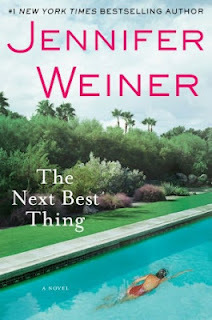 But Jennifer Weiner wrote a heartfelt fresh-look story about a screenwriter in love trying to make it in the land of beauty, dreams and stardom. I am rarely disappointed with Jennifer Weiner's books and main characters. My heart immediately went out to Ruth when she wrote five simple lines in her childhood journal: I will never be beautiful. From that moment on, I rooted for Ruth and her grandmother throughout the rest of the story. I wanted her to be okay, to succeed at the battles she chose, and to feel beautiful. Bravo on the author's tenth book! 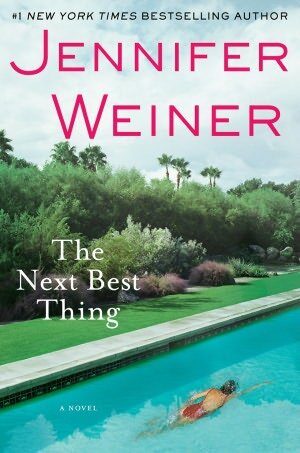 Weiner's writing draws readers in, takes them on a journey, tugs at their heartstrings, then comforts you with a hug at the end. The Next Best Thing is perfect for summer reading! It begins with a quote by music group "The Smiths"—"Please, please, please, let me, let me, let me, let me get what I want this time." This is what I wish for whenever I open a new book; The Next Best Thing granted my wish.